The 2018 Ethics in Action Dinner Gala, which honours the Scotiabank Ethical Leadership Award recipient, is scheduled for November 22, 2018. This annual celebration is a profound validation of Dalhousie’s commitment to the highest standards of excellence in ethical behaviour. Tickets will go on sale in October 2018. For those in the Halifax area, this will be an exciting must-attend event. For those of us who live elsewhere, highlights will be available on Dalhousie’s Ethics in Action website. The 2018 recipient of the Scotiabank Ethical Leadership award is Lieutenant-General Roméo Dallaire. The 2017 recipient of the Scotiabank Ethical Leadership award was The Honourable Justice Rosalie Silberman Abella. 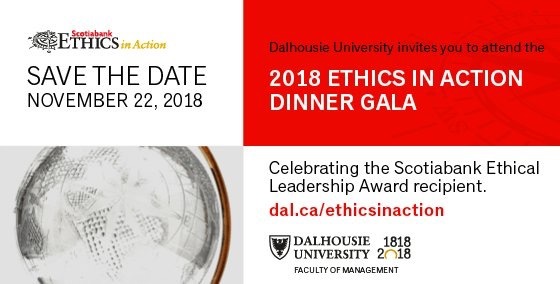 Categories: Dalhousie University, Ethics in Action, Scotiabank Ethical Leadership Award Tags: 2017 Recipient, 2018 Recipient, Ethics in Action, Lieutenant-General Roméo Dallaire., Scotiabank Ethical Leadership Award, The Honourable Justice Rosalie Silberman Abella.